The question of whether Canada should buy 65 F-35 Joint Strike Fighters from Lockheed Martin has been debated for less than two years, though it may seem like it's been going on for much longer. The issue even led to the 2011 federal election, when opposition MPs voted non-confidence in the government after requests for details on the cost of the F-35s and the Conservatives' crime legislation went unanswered. 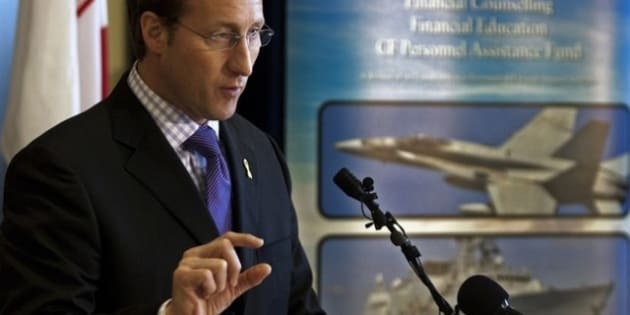 Defence Minister Peter MacKay, Public Works Minister Rona Ambrose and then-industry minister Tony Clement announced on July 16, 2010, that Canada would buy the fighter jets to replace its CF-18s. The Liberals had initiated a memorandum of understanding with Lockheed Martin and a number of allied countries to develop the jets, but Canada has not signed a contract for the purchase. Since July 2010, the question of whether the $9-billion cost is accurate has been as widely debated as the question of whether there should have been an open competition. On April 3, Auditor General Michael Ferguson reported the government’s internal cost estimates from 2010 were almost $10 billion higher than the $16 billion they'd said publicly. The government says they weren't including fuel or pilot salaries in their estimate, arguing that's normal. As it turns out, the government had a number of occasions to provide a tally of the full costs — besides the repeated questions in the House of Commons, committee appearances and interviews. Since July 2010, Liberal MPs have tabled at least 20 order paper questions in the House. An order paper question allows for more detailed queries and responses than the oral fireworks in question period. But none yielded the information the auditor general dug up. July 16, 2010: MacKay, Ambrose and Clement announce the government will buy 65 F-35 fighter jets. Asked about maintenance and support costs, Ambrose was coy. "Of course we have some estimates, but the actual aircraft is not in production yet. When the aircraft comes off the production line, we expect to negotiate the in-service support costs," she said. The House finance committee, working from a motion by Liberal MP Scott Brison, requested that the Department of Finance give it "the estimated cost of the F-35 aircraft per airplane, how this fits into the fiscal framework, and that this material be submitted to the committee within 10 days." The response cited National Defence estimates and said the per-plane cost was "in the low- to mid- $70 million US over the timeframe Canada is planning on purchasing aircraft. This is the unit cost per aircraft and does not include related costs such as spare parts, weapons, training or infrastructure." The answer also said the F-35 project wouldn't need "new or unplanned sources of funds" because money had already been earmarked in previous budgets. The House finance committee followed up its first request by asking for "all documents that outline acquisition costs, lifecycle costs, and operational requirements associated with the F-35 program and prior programs (CF-18)." National Defence responded by saying it would take 10 weeks of work by the entire F-35 program management team. "As such, a complete response to the request cannot be provided within the required seven calendar days," as per the request. Brison rose in the House on a question of privilege, complaining that the government was infringing on his privilege as a member of Parliament by refusing to hand over the information MPs had requested. Then-speaker Peter Milliken listened to arguments but wouldn't rule for another month. The government tables more documents, but not enough to satisfy opposition MPs. MPs voted on a motion ordering the government to produce the documents ordered by the finance committee. The motion passed, giving the government a March 7 deadline. Milliken ruled that, in his view, the documents provided by the government on Feb. 17, 2011, weren’t enough to satisfy the request by MPs on the finance committee. He said he found the government's lack of response to be "unsettling," but also pointed to a greater concern of "the absence of an explanation for the omissions." He had ruled the year before that the powers of the House to request documents is "broad" and "absolute." Parliamentary Budget Officer Kevin Page estimated it would cost $29.3 billion to buy the planes and keep them flying for 30 years (the government's estimate was based on 20 years and, MacKay said on April 10, 2012, does not include the cost of fuel or pilot salaries). Also on March 17, the government provided documents requested by the Finance committee on the cost of its crime legislation and corporate tax cuts, but only in English, so they couldn't be distributed to MPs, according to the rules of the House. The documents were requested in the same motion that requested the F-35 records. MacKay called Page's findings "flawed." A report by the procedure and House affairs committee, with Conservative MPs disagreeing, said "the government's failure to produce documents constitutes a contempt of Parliament." The Liberals put a motion of non-confidence based on that report in front of the House and the government falls, triggering the May 2, 2011, federal election. The Finance committee returns to its request, asking for the documents tabled March 17 to be translated into French. The documents are tabled March 16, 2012. Auditor General Michael Ferguson says National Defence likely underestimated the full cost of the F-35 and didn't give complete information to Parliament. Ferguson says the department's own estimate puts personnel, operating and maintenance costs at $16 billion, for a total 20-year cost of $25 billion for the F-35s.